Ukraine beat Hungary to win the Central European Development League Twenty20 Cup (12-15.7.2018). Meanwhile Switzerland had to settle for joint 3rd after losing their first two matches against hosts Poland by 10 runs and Hungary by 2 wickets, while their third against Ukraine was abandoned due to rain and the 3rd/4th play-off match was rained off without a ball being bowled. 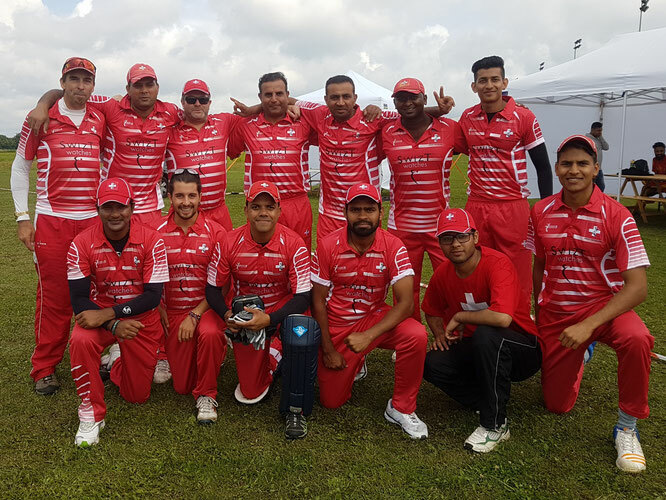 Switzerland lost their opening match at the Central European Development League Twenty20 Cup in Warsaw (12-15.7.2018) against hosts Poland by 10 runs. Aidain wasn't well & had to retire after making a strong start in another match that was very close against the Poles where somewhere between 1 ball & 1 over makes the difference!! Switzerland lost their second match against Hungary by 2 wickets in a low-scoring, rain-affected, affair. Switzerland batted first and scored 144-8 in 20 overs with another 50 for Aidan Andrews, 24 from Shahnawaz to go with his 45 against Poland, and 18 from Matthew Martin adding to his 19 against Poland. But in a rain interrupted 2nd innings Hungary just got across the line with 3 balls & 2 wickets in hand. In another very tight match that the Swiss team were very unlucky to come out on the wrong side of the result. Everyone is now focused on Saturdays game against Ukraine and depending on other results today and tomorrow possibly still a chance of playing in the final. Schedule & scorecards can be followed online on cricHQ.